Ceiling Supports and Custom Size Shower Curtains available. 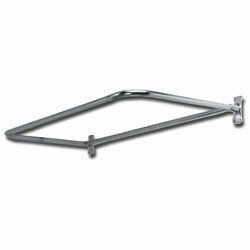 Please contact our customer service department at 888-322-7762 for more information..
D Shaped Shower Rod - 48" x 26"
The shower rod is mounted onto the wall with two heavey duty rectangular wall flanges. Finished in Polished Chrome, mounting hardware and flanges included. View More In Bathroom Fixtures. If you have any questions about this product by Barclay, contact us by completing and submitting the form below. If you are looking for a specif part number, please include it with your message.